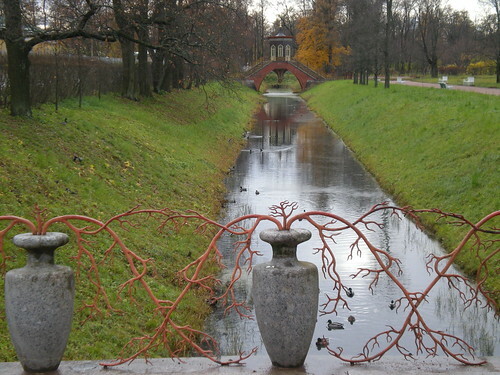 Bridge of Vases, popularly known as Chinese Bridge, is a small bridge over the Krestovy Channel in the Chinese Village in the Alexander Park of Tsarskoye Selo, Pushkin, St. Petersburg. There are two other smaller Chinese bridges in the park and to distinguish this bridge from the other two it is generally referred as Large (or Big) Chinese Bridge. Main feature of the bridge are its exquisite parapets in the form of tall granite vases with ornamental intertwined branches of red coral emanating from the vases. In addition to granite vases and forged iron branches of coral, the bridge is decorated with four Chinese figures seated on pedestals holding Chinese lanterns on long poles. The Bridge which leads to main gate of the Catherine Palace, was commissioned by Catherine the Great as part of her plan to create a Chinoiserie in her park. The bridge was designed by Charles Cameron and was completed in 1781. The four Chinese figures were originally made of painted plaster/limestone, which decayed with passage of time and became completely dilapidated. In 1860s these were replaced by brightly painted zinc sculptures, which perished during the Second World War and were restored in June of 2010 on the occasion of 300th anniversary of Tsarskoye Selo.